Leonardo was one of the “masters of water” involved in the planning stages of a scheme devised by the Florentine government to divert the river Arno away from Pisa, in an attempt to curb its power over the sea. He also turned his thoughts to designing a canal to bypass the un-navigable sections of the Arno west of Florence. In this drawing, the Arno snakes across the double page, from Florence at the lower right to Pisa at the extreme left. Two lines curving north from Florence indicate alternate routes between Florence and Pistoia. One went through Prato, the other via Poggio a Caiano. This is in part the route followed by the builders of the A 11 motorway almost 450 years later. 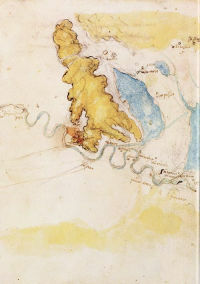 Through such work, Leonardo acquired an unprecedented knowledge of the geology of the area. 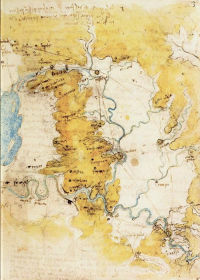 His maps for project have an important place in the history of cartography. In this imagined “aerial” view of the landscape, different colours indicate the different height of landscape features, demonstrating Leonardo’s extraordinary ability to visualize natural forms in space as if viewed from an immense distance. Whatever there is in the universe through essence, presence or imagination, (the painter) has it first in his mind and then in his hands, and these are of such excellence that they can generate a proportional harmony in the time equivalent to a single glance, just as real things do.